When I'm not being a photographer, a dancer, or making jewelry, I write. Specifically art history. I plan on writing about other subjects. 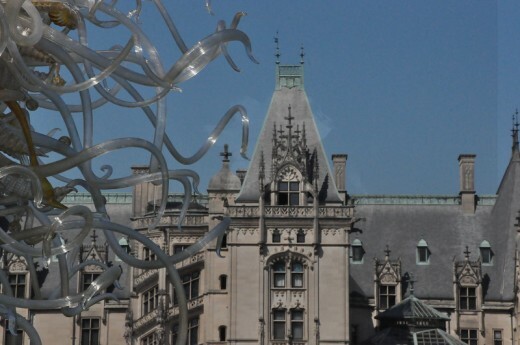 I went to see Chihuly's temporarily installed sculptures at the Biltmore Estate. 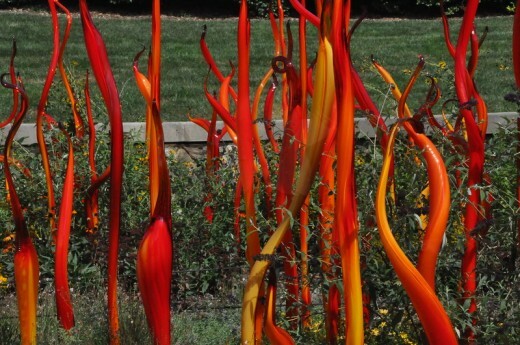 There were Chihuly works inside Biltmore House but the ticket I had only allowed me to see the gardens. 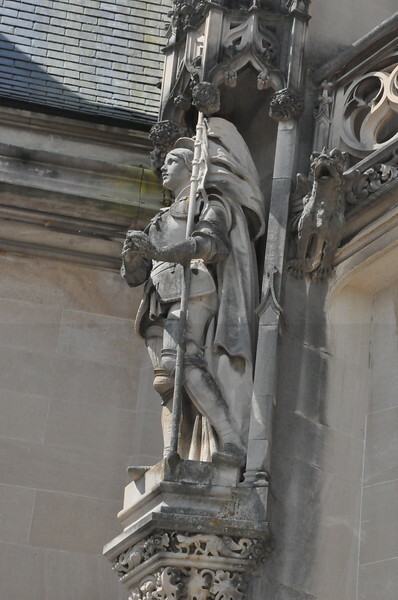 I believe there was another sculpture far beyond Biltmore, but I was so exhausted from walking around the main gardens and the conservatory, I never visited that one. I don't think I even remember learning about that one until after I left Asheville. 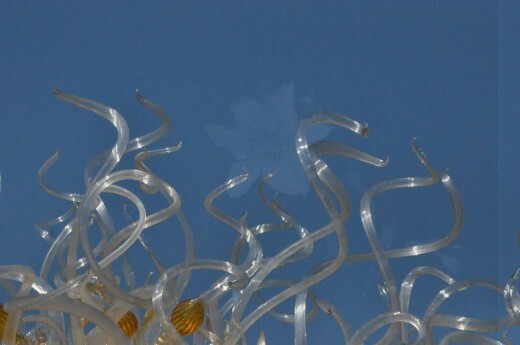 So, about the Chihuly sculptures themselves. 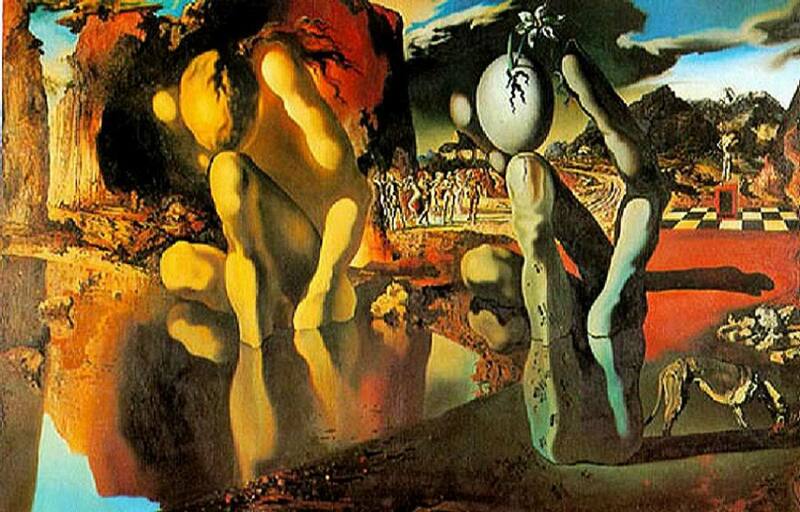 They curl, swell, wave, wriggle, make reflections in water, create shadows, shoot up straight into the sky, or curl down to (or away from) the viewer. 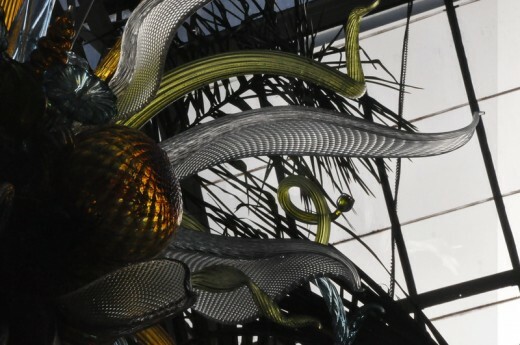 How were the Chihuly sculptures installed? Walking around, I noticed that the glass art complemented the many locations they were installed in. Most of them stood out, but a few almost disappeared into the environment. 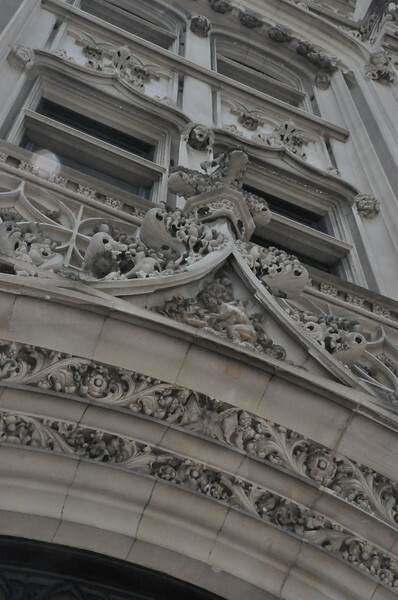 I also noticed certain visual patterns were created as a result of the way these artworks were situated. 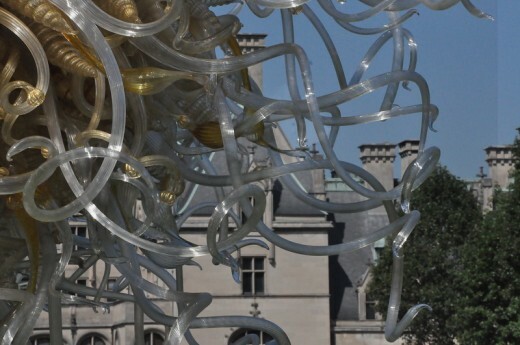 For example, the work Sole d'Oro that was placed at Biltmore Estate's Front Lawn? 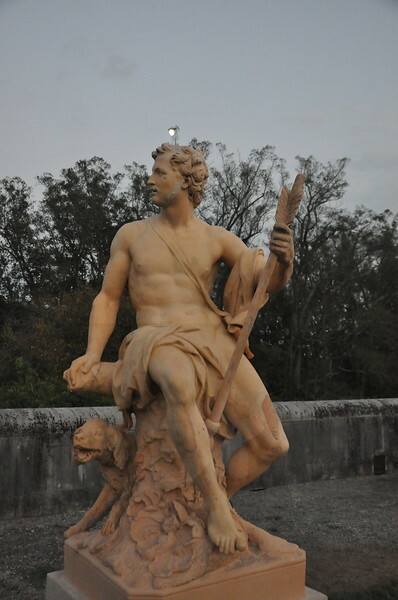 I think it was meant to complement the Diana Temple found at the opposite end of the Estate. 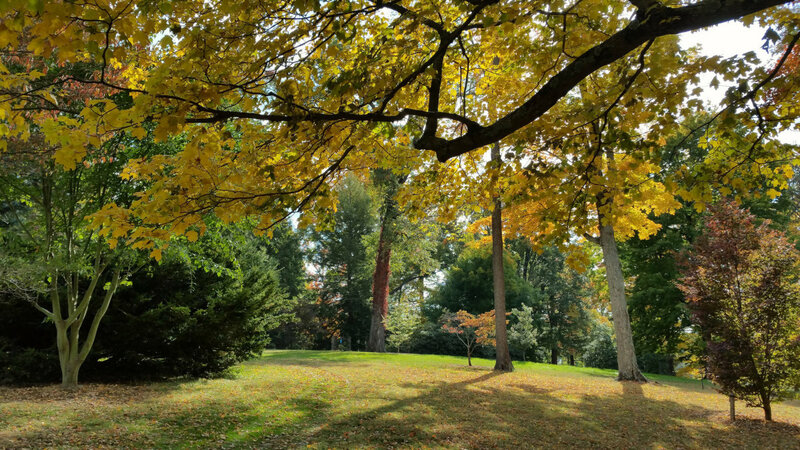 This pattern continued in the Italian Garden with another Chihuly sculpture (Palazzo Ducal Tower) that created a triangular outline with two Neoclassical sculptures belonging to the Biltmore Estate. 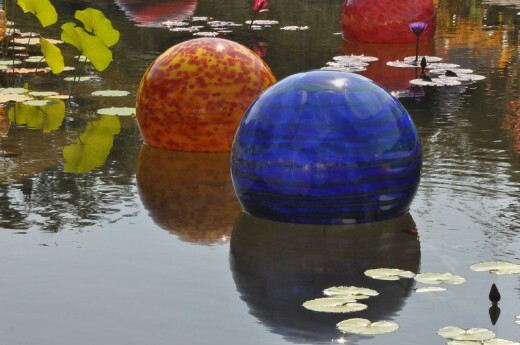 Other sculptures such as these large bright globes (Niijima Nights) and long glass purple rods installed in the ponds complemented the lotus flowers and green lily pads that floated nearby. 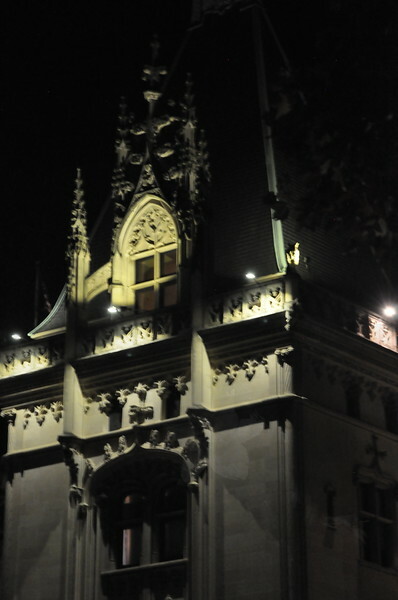 When I saw those same globes at night, someone I was with noted that the planets were out (the moon was out too). Looking at the patterned globes at my feet and the planets twinkling in the night sky above, I wondered if that was intentional. 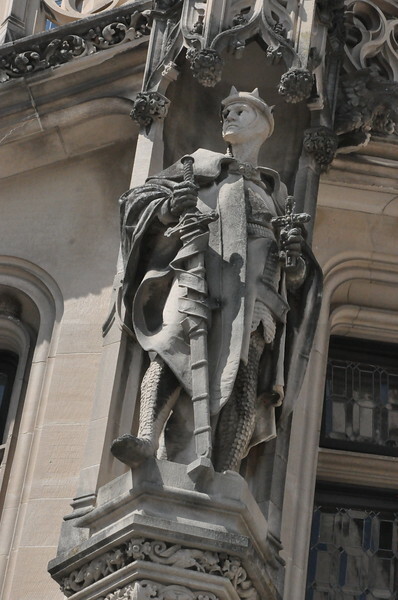 As I mentioned in the first paragraph, most of the sculptures were installed in such a way to make them stand out of their respective environments. 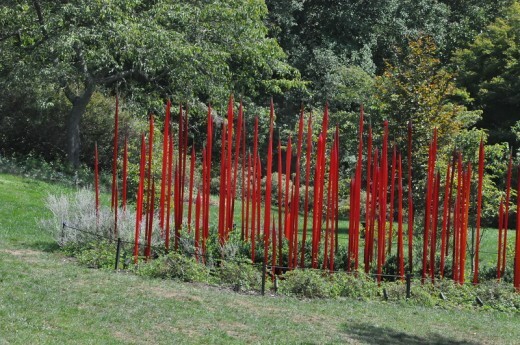 To elaborate, there were many sculptures consisting of long bright red tubes (Red Reeds) that either stood ramrod straight or were wavy amongst green grass and green trees. However, if one was at the Walled Garden, you had to look down to find green sculpture, because they were practically camouflaged amongst the green flora and almost overwhelmed by the other bright, colored glass sculptures. Biltmore's conservatory is full of greenhouses (plus hot houses and cool houses) that have Chihuly sculptures hanging above one's head. 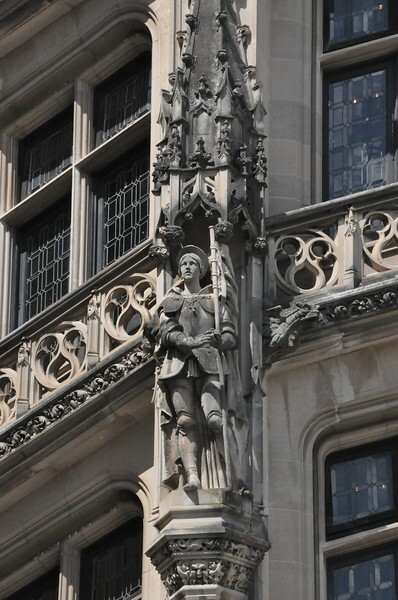 Compared to the other sculptures, they are almost subdued with their light green, yellow, and pink color schemes. Were they meant to reflect the greenhouse skylines rather than the actual plants housed there? I do not know. 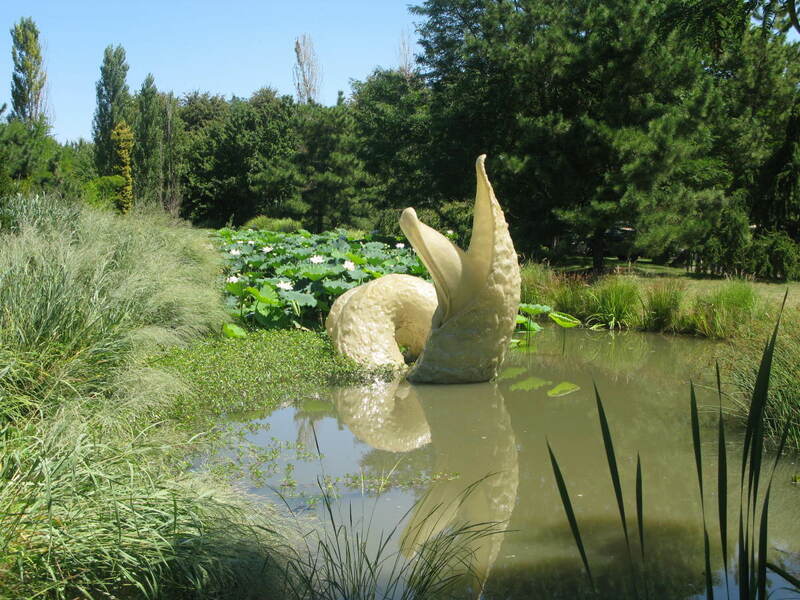 What do Chihuly sculptures remind you of? Chihuly sculptures are such three dimensional Rorschach tests that one's mind can think of so many things. 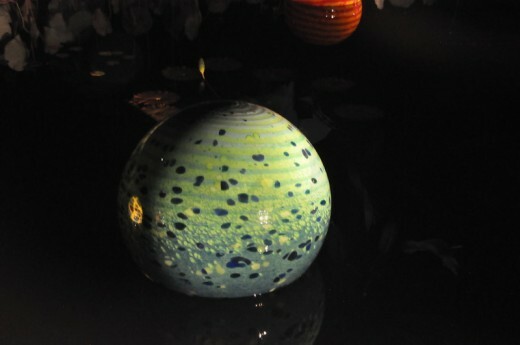 A cluster of Chihuly glass can resemble a frozen explosion. Or look similar to scientific illustrations of concepts that are invisible to the naked eye. Or symbols used by meteorologists to predict the weather. One set of wavy red tubes in front of the conservatory reminded me of heat waves. To emphasize this point, when I visited the exhibit during the daytime, it was a hot day with a bright blue sky and equally bright white clouds. 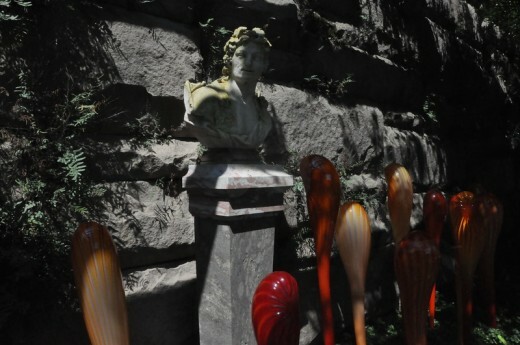 In the Italian Garden's ponds, there were Chihuly sculptures that burst with color and had varying shapes and sizes. 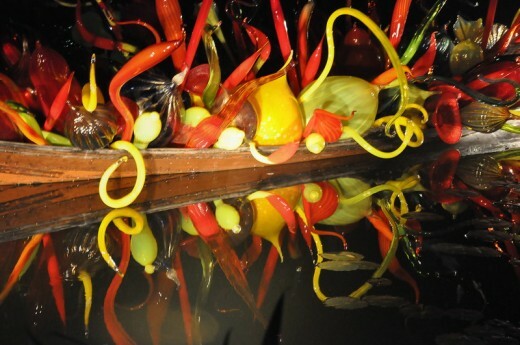 In one pond, there were two boats (Float Boat and Carnival Boat) filled with Chihuly glass art. One filled with glass globes and the other filled with more diverse shapes that called to mind food (such as fruit and vegetables) from Baroque still lifes. 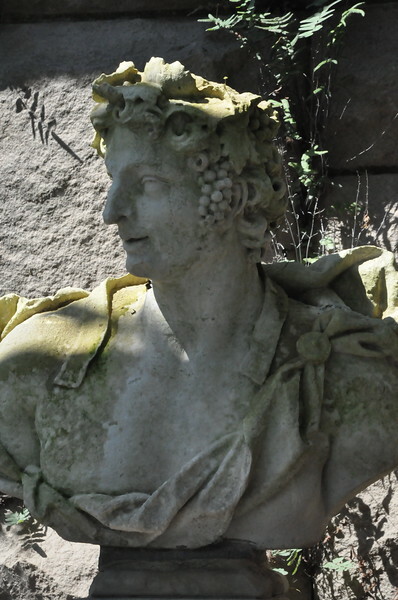 In the Walled Garden, there are multiple busts of godly (or possibly just human) beings (the grape crowned one was very likely Bacchus) and below them were long shapes that varied between flat, thin, tube shaped, and fat. 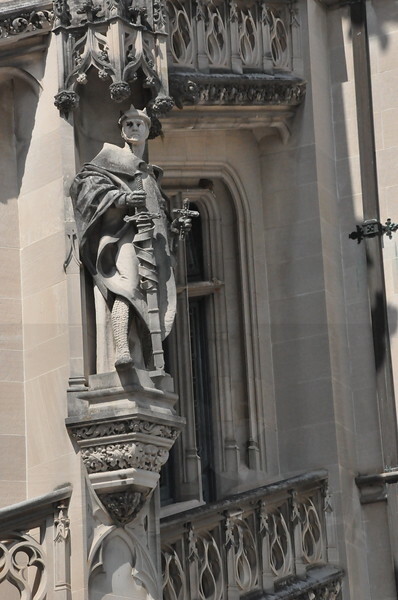 Furthermore, they all looked as though they were reaching up towards the busts. I have been reading Lovecraft, and this reminded me of Lovecraft's descriptions of ancient abandoned ruined cities filled with tentacled beings and strange architecture. On the Biltmore art and architecture that will stay long after the Chihuly sculptures are taken down. 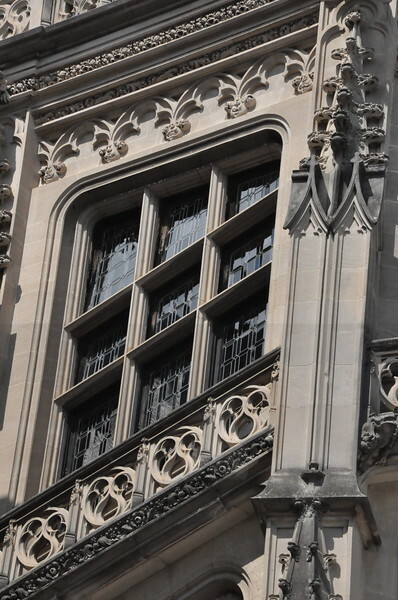 According to the official website, this immense house is a "French Renaissance chateau". 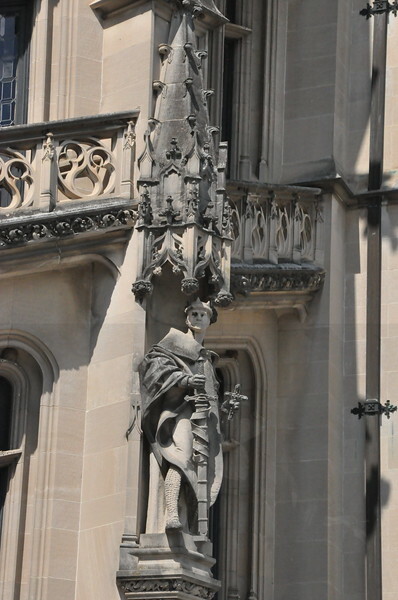 However, I did notice that the house’s exterior is full of Gothic touches with its designs and sculptures of men looking over people visiting Biltmore, but the gardens have these East Asian (Japanese, according to to this article) and Neoclassical accents. 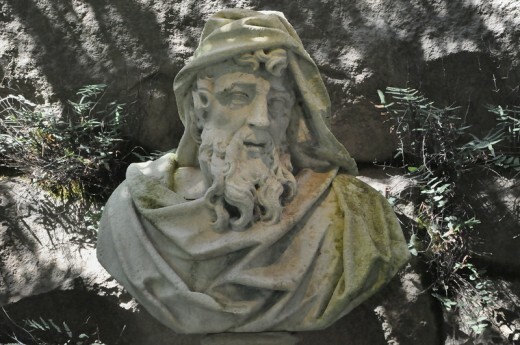 Stone lanterns and sculptures of Greek gods stand either stoic, peaceful, or dance about the mountain landscape that descends into a blue color scheme. When you drive through the immense landscape of the Biltmore property, you will see a substantial amount of bamboo trees. Yes, I did. 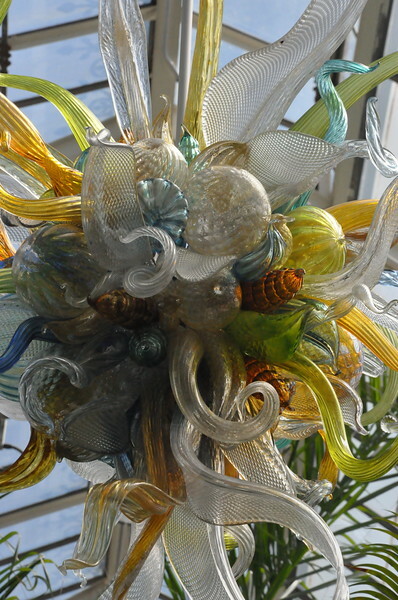 Chihuly sculptures are always a delight to look at no matter what context they are placed in. 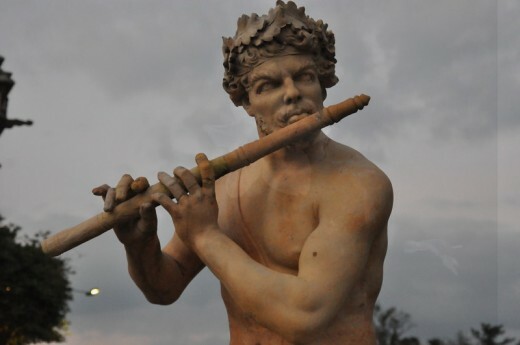 Regarding some sculptures that melded in with the environment, I think they could have done a better job installing them so one would not accidentally overlook them. Furthermore, because I forgot to write the names down, I had to look up the names of the works on official websites and other reviews of the exhibit. 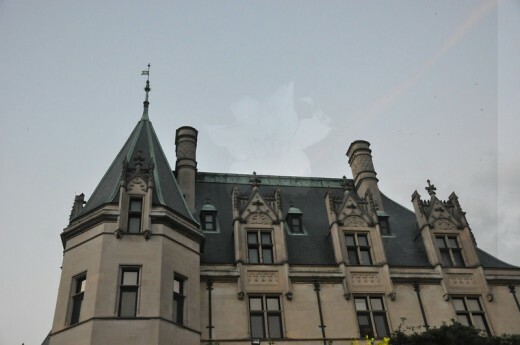 To see more photos of the exhibit and Biltmore itself, click on this link! I have photographed Italy, Ireland, the Carolinas, Florida, and hopefully more places in the future! I decided to rewrite the title to this article. This is an interesting exhibition. Interesting how more places of interest in the UK are introducing temporary exhibitions. 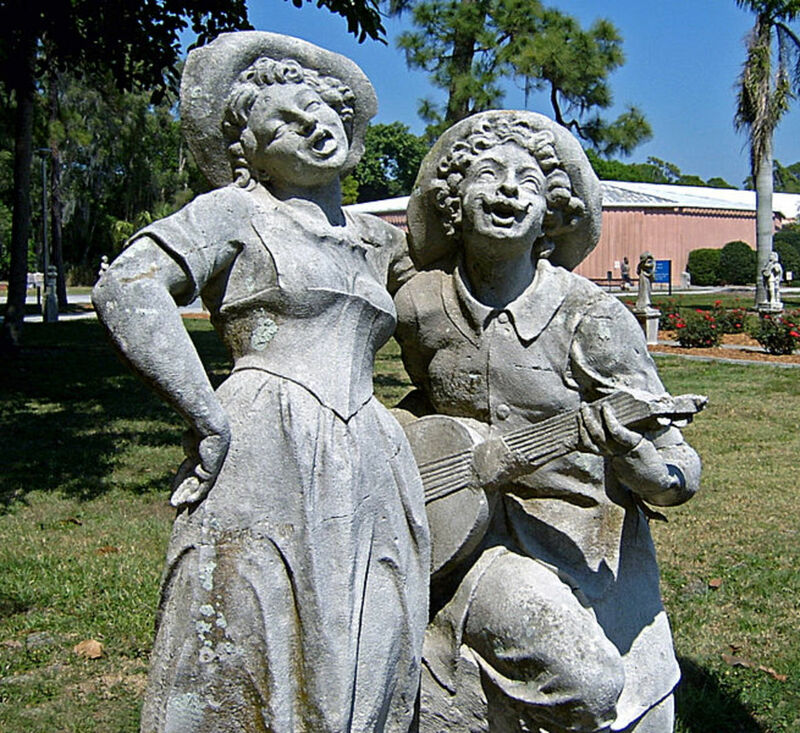 I think they are great to bring back visitors and keep their interest.